Mrs. Kearney's Tavern at Night. What's old is new again: More than a century and a half ago, Mrs. Rachel Kearney, widowed for a second time and with young children still in her care, made ends meet by running a tavern from her home on the Hudson River beneath the Palisades. All these decades later, at the Alpine Boat Basin & Picnic Area in the Palisades Interstate Park, her plain four-room house still stands in the shadow of the tall cliffs. Called today the Kearney House, it is open to the public to tour and learn about on weekend afternoons from May to October. Several evenings a year, however, it also opens its Dutch doors to bring Mrs. Kearney's tavern back to life. On these evenings, staff and volunteers at the little historic house offer up "Punch & Pie at Mrs. Kearney's Tavern," during which up to twenty guests "come down to the tavern" for spiced wine punch, freshly baked pies and other morsels, and plenty of good cheer—all by real candlelight and the glow of stone hearths. From beneath his top hat, the tavern's regular musician, Mr. Thaddeus MacGregor (by day a musician and teacher who lives in Englewood), provides mirth and music, while guests enjoy tall tales and real-life adventure yarns about life along Hudson's River as related by Kearney House director Eric Nelsen. Ample time is also allowed for guests simply to socialize with one another—as well as with staff and volunteers dressed in period garb—or to explore the house by candlelight. Reserve now for our spring 19th-century tavern adventures at the Kearney House, to be held on Wednesday evenings, April 15 & 22, from 7:30-10 PM. The Palisades Parks Conservancy, Inc., (dba Friends of the Palisades, Inc.), the charitable partner of the Palisades Interstate Park Commission is a free-standing federally registered non-profit corporation exempt under section 501(c)(3) of the Internal Revenue Code. Donations may be made over our secure Web site at palisades.exhibit-e.com/donate/ or by mailing to Palisades Parks Conservancy, Bear Mountain State Park, Administration Building, Bear Mountain, NY 10911. For more information, please call us at 845-786-2701 or send email toadmin@palisadesparksconservancy.org. This Saturday, April 4 at 10 a.m., come to the Hudson Highlands Nature Museum’s Outdoor Discovery Center, entrance on Muser Drive, across from 174 Angola Road, Cornwall, to learn how wildlife cares for their young! The season for wildlife babies is here! Join Curator of Living Exhibits, Pam Golben, for an informative slide show presentation. Participants will learn how wildlife cares for their young in a way that is very different from humans. Find out ways you can help and protect the wildlife babies you might find alone in your own backyard. This program is recommended for adults with or without children, and for children ages 7 and older. Cost: $5 per person. Members: $3. 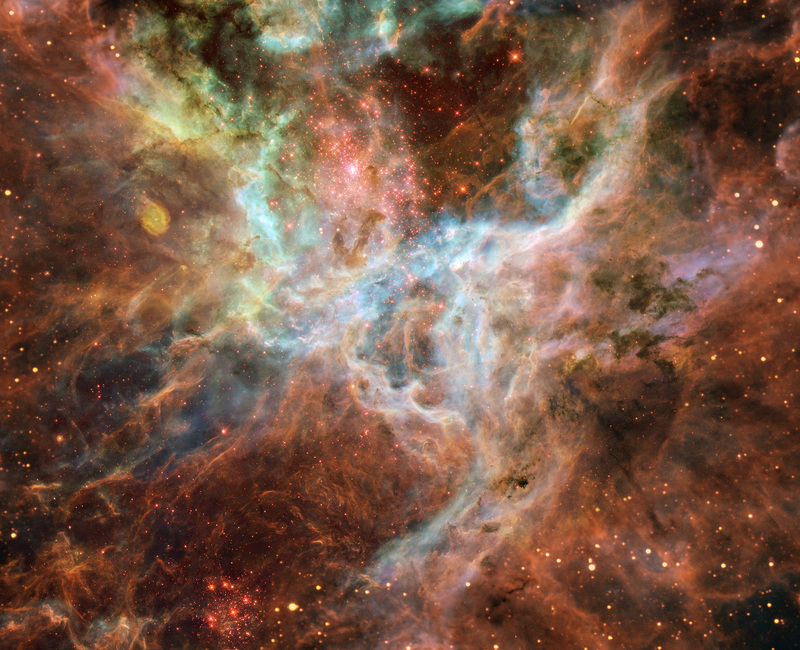 Explanation: In the heart of monstrous Tarantula Nebula lies huge bubbles of energetic gas, long filaments of dark dust, and unusually massive stars. In the center of this heart, is a knot of stars so dense that it was once thought to be a single star. This star cluster, labeled as R136 or NGC 2070, is visible just above the center of the above image and home to a great number of hot young stars. The energetic light from these stars continually ionizes nebula gas, while their energetic particle wind blows bubbles and defines intricate filaments. The above representative-color picture of this greatLMC nebula details its tumultuous center. 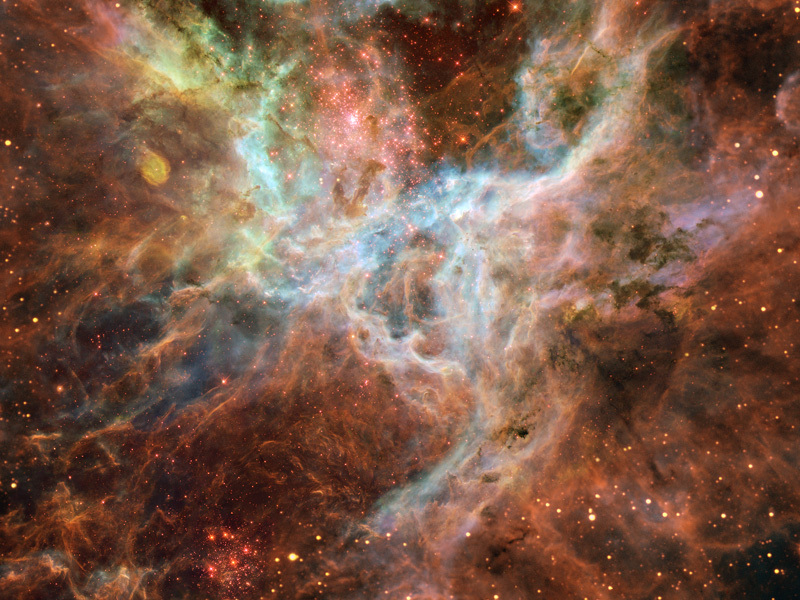 The Tarantula Nebula, also known as the 30 Doradus nebula, is one of the largest star-formation regions known, and has been creating unusually strong episodes of star formation every few million years. The King of the Sacred Steel Guitar movement, Robert Randolph, is a virtuoso pedal steel guitar player who has performed with Eric Clapton, Dave Matthews, Santana and many others. He set the New York City music scene on fire in 2000 when he began playing his first club dates there. Randolph's own group, the Family Band, includes cousins Danyell Morgan (bass) and Marcus Randolph (drums) and John Ginty (organ). Singer, songwriter, and guitarist Keller Williams is literally a one-man jam band. His fascinating live shows feature him solo on-stage with a Gibson Echoplex Digital Pro looping unit, creating his backing loops in the moment, building and improvising as he goes on his custom-made ten-string guitar. Williams is an utterly unique performer whose musical eccentricities don't keep him from being immediately accessible. Critic's darling, NYC based Fountains of Wayne is anchored by the singer/songwriter duo of Adam Schlesinger and Chris Collingwood. Schlesinger has also enjoyed success as the author of the title theme to Tom Hanks' rock & roll movie That Thing You Do! Their most recent album, Traffic and Weather continues the band's tradition of wedding power pop orchestration to literate lyrics about travel, relationships, and occupational monotony. Celebrate Easter at Bear Mountain State Park! Our Easter Brunch offers an array of chilled salads, smoked salmon display, made-to-order omelets, carving station, kids buffet, lavish desserts and much more. Complimentary champagne or Bloody Mary Bar. $15.95 Children (ages 6-12)/Age 5 and under free. Bear Mountain State Park is part of the Palisades Interstate Park Commission, which administers 29 parks, parkways, and historic sites for the Office of Parks, Recreation and Historic Preservation in New York as well as the Palisades Interstate Park and parkway in New Jersey. For more information about New York State parks and historic sites, please visit www.nysparks.com, for information about the New Jersey section of the PIPC please visit www.njpalisades.org, and for more information about the Palisades Parks Conservancy and the Palisades Interstate Park parks and historic sites, please visitwww.palisadesparksconservancy.org. The Palisades Parks Conservancy, Inc., (dba Friends of the Palisades, Inc.), the charitable partner of the Palisades Interstate Park Commission is a free-standing federally registered non-profit corporation exempt under section 501(c)(3) of the Internal Revenue Code. Donations may be made over our secure Web site at palisades.exhibit-e.com/donate/ or by mailing to Palisades Parks Conservancy, Bear Mountain State Park, Administration Building, Bear Mountain, NY 10911. For more information, please call us at 845-786-2701 or send email to admin@palisadesparksconservancy.org. If you’re too scared to visit New York’s most haunted spots solo, Phil Schoenberg, a history professor at Queens College, is the man for the job. His “Ghosts of New York” tours offer three area- and ghost-specific tours of the city. Plus, patrons with a ticket stub for “The Haunting in Connecticut” get half off all tours through April. 1: Peter Stuyvesant and His Ghostly Friends This tour leaves every Saturday at 7:30 p.m. and meets in front of the lion sculpture in front of St. Mark’s Church in-the-Bowery. You’ll search for the ghosts of Peter Stuyvesant, Joe Papp, Washington Irving, Edgar Allan Poe, Harry Houdini and new ghost Abe Lebewohl, who owned the Second Avenue Deli. 2: Ghosts of Grand Central This tour meets every Saturday afternoon at 1 in front of the New York Transit Museum. There will be talk of the ghost of William Vanderbilt, who presided over New York Central and Hudson River Railroad Company, as well as Franklin D. Roosevelt — who boarded trains in secret places near the rear of the station so his disability would remain hidden, J.P. Morgan and other historical New York figures. 3: Ghosts of the City The tour searches the city for the spirits of the Algonquin Indians, slaves, Dutch settlers, Walt Whitman, Captain Kidd and the ghosts of Trinity Churchyard to name a few. Get your tickets now! We will be back at the Jacob Javits Convention Center from April 10-19, 2009 and we will have some of the hottest cars and trucks ever seen all under one roof. That means more sneak peeks, more brand new '09 & '10 production models and more concept vehicles than ever before. Backpacks will NOT be allowed on the show floor. Cameras, video cameras, and strollers ARE welcome. For wheelchairs only, please call 212-216-2196. For your convenience, purchase your E-Tickets on this website or on-site at our ticket kiosks that accept credit and most debit cards. The New York Auto Show is value-packed fun for the whole family combining the best place to compare the world’s finest cars and trucks with state-of-the-art displays, celebrities, prizes, giveaways, interactive exhibits and vehicle test drives. For 109-years, NYIAS has ignited the passion and stirred the soul of car lovers with its futuristic concept cars and new vehicles and 2009 is no exception. Compare every new car on the market under one roof, in one day, without any pressure to buy. Whether you’re looking for a small car that makes a big impression, something fun, fast and frugal, or you want to get plugged into a hybrid or electric vehicle there is no better place to research your next new car, crossover, minivan, SUV, or truck. Even if you’re not looking to buy a car until much later in the year, the Show is the only place that you can explore the technological breakthroughs that are changing the way we drive. From revolutionary safety equipment that automatically brakes the vehicle if it senses an impending crash to features that allow your car to park itself, you can guarantee that the car you buy tomorrow will be radically different from the one you are driving today. Come to the Show to find out just how different! Come early and stay late, the show is open from 11 a.m. until 10:30 p.m. Monday through Saturday and 10 a.m. until 7 p.m. on Sundays. You’ll have fun the whole family can enjoy! Explanation: Is this a mud volcano on Mars? If so, could it be dredging up martian microbes? This strange possibility has been suggested recently and seems to fit several recent observations of Mars. First of all, hills like this seem to better resemble mud volcanoes on Earth than lava volcanoes and impact craters on Mars. Next, the pictured dome has an unusually textured surface consistent with fractured ice. Infrared images from space indicate that hills like this cool more quickly than surrounding rock, consistent with a dried mud composition. The hills also reflect colors consistent with a composition that formed in the presence of water. Finally, unusual plumes of gas containing methane have been found on Mars with unknown origin. These gas plumes could conceivably have been liberated by mud volcanoes, were the initially warm mud to contain methane-producing microbes drifting in a previously unobservable underground lake. 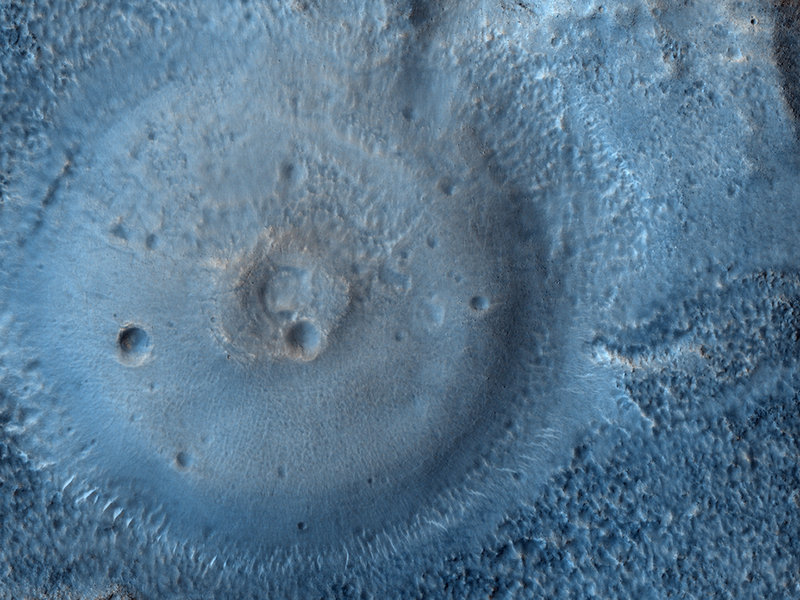 A candidate mud volcano over 100 meters across is pictured above in the northern plains of Mars.